Wine (from Latin vinum) is an alcoholic beverage made from grapes, generally Vitis vinifera, fermented without the addition of sugars, acids, enzymes, water, or other nutrients. Yeast consumes the sugar in the grapes and converts it to ethanol and carbon dioxide. Different varieties of grapes and strains of yeasts produce different styles of wine. These variations result from the complex interactions between the biochemical development of the grape, the reactions involved in fermentation, the terroir, and the production process. Many countries enact legal appellations intended to define styles and qualities of wine. These typically restrict the geographical origin and permitted varieties of grapes, as well as other aspects of wine production. Wines not made from grapes include rice wine and fruit wines such as plum, cherry, pomegranate and elderberry. Wine has been produced for thousands of years. The earliest known traces of wine are from China (c. 7000 BC), Georgia (c. 6000 BC), Iran (c. 5000 BC), and Sicily (c. 4000 BC). The earliest known winery is the 6,100-year-old Areni-1 winery in Armenia. Wine reached the Balkans by 4500 BC and was consumed and celebrated in ancient Greece, Thrace and Rome. Throughout history, wine has been consumed for its intoxicating effects. Wine has long played an important role in religion. Red wine was associated with blood by the ancient Egyptians and was used by both the Greek cult of Dionysus and the Romans in their Bacchanalia; Judaism also incorporates it in the Kiddush and Christianity in the Eucharist. Licensed under Free Art License (A.Savin (Wikimedia Commons · WikiPhotoSpace)). Wine has been produced for thousands of years. The earliest known traces of wine are from China (c. 7000 BC), Georgia (c. 6000 BC), Iran (c. 5000 BC), and Sicily (c. 4000 BC). The earliest known winery is the 6,100-year-old Areni-1 winery in Armenia. Wine reached the Balkans by 4500 BC and was consumed and celebrated in ancient Greece, Thrace and Rome. Throughout history, wine has been consumed for its intoxicating effects. Archaeological evidence has established the earliest known production of wine from fermented grapes during the late Neolithic site of Hajji Firuz Tepe in the northern Iran Zagros Mountains or early Chalcolithic site in the northern edge of the Middle East. The earliest chemically attested grape wine was discovered at Hajji Firuz in the northwestern Zagros Mountains dating back to 5400 BC. Both archaeological and genetic evidence suggest that the earliest production of wine may slightly predate this: with the earliest wine-making likely having taken place in the Southern Caucasus (which encompasses Armenia, Georgia, and Azerbaijan), or the West Asian region between Eastern Turkey, and Northwestern Iran. A 2003 report by archaeologists indicates a possibility that grapes were mixed with rice to produce mixed fermented beverages in China in the early years of the seventh millennium BC. Pottery jars from the Neolithic site of Jiahu, Henan, contained traces of tartaric acid and other organic compounds commonly found in wine. However, other fruits indigenous to the region, such as hawthorn, cannot be ruled out. If these beverages, which seem to be the precursors of rice wine, included grapes rather than other fruits, they would have been any of the several dozen indigenous wild species in China, rather than Vitis vinifera, which was introduced there 6000 years later. The spread of wine culture westwards was most probably due to the Phoenicians who spread outward from a base of city-states along the Lebanese, Syrian, Palestinian, and Israeli coasts. The wines of Byblos were exported to Egypt during the Old Kingdom and then throughout the Mediterranean. Evidence includes two Phoenician shipwrecks from 750 BC discovered by Robert Ballard, whose cargo of wine was still intact. As the first great traders in wine (cherem), the Phoenicians seem to have protected it from oxidation with a layer of olive oil, followed by a seal of pinewood and resin, similar to retsina. 74/ wo-no-wa-ti-si, meaning "wine garden", written in Linear B inscriptions. Linear B also includes, inter alia, an ideogram for wine, i.e. . Other beverages called "wine", such as barley wine and rice wine (e.g. sake), are made from starch-based materials and resemble beer more than traditional wine, while ginger wine is fortified with brandy. In these latter cases, the term "wine" refers to the similarity in alcohol content rather than to the production process. The commercial use of the English word "wine" (and its equivalent in other languages) is protected by law in many jurisdictions. Wine is usually made from one or more varieties of the European species Vitis vinifera, such as Pinot noir, Chardonnay, Cabernet Sauvignon, Gamay and Merlot. When one of these varieties is used as the predominant grape (usually defined by law as minimums of 75% to 85%), the result is a "varietal" as opposed to a "blended" wine. Blended wines are not considered inferior to varietal wines, rather they are a different style of wine-making; some of the world's most highly regarded wines, from regions like Bordeaux and the Rhone Valley, are blended from different grape varieties. According to Canadian Food and Drug Regulations, wine in Canada is an alcoholic beverage that is produced by the complete or partial alcoholic fermentation of fresh grapes, grape must, products derived solely from fresh grapes, or any combination of them. There are many materials added during the course of the manufacture, such as yeast, concentrated grape juice, dextrose, fructose, glucose or glucose solids, invert sugar, sugar, or aqueous solutions. Calcium sulphate in such quantity that the content of soluble sulphates in the finished wine shall not exceed 0.2 per cent weight by volume calculated as potassium sulphate. Calcium carbonate in such quantity that the content of tartaric acid in the finished wine shall not be less than 0.15 per cent weight by volume. Also, sulphurous acid, including salts thereof, in such quantity that its content in the finished wine shall not exceed 70 parts per million in the free state, or 350 parts per million in the combined state, calculated as sulphur dioxide. Caramel, amylase and pectinase at a maximum level of use consistent with good manufacturing practice. Brandy, fruit spirit or alcohol derived from the alcoholic fermentation of a food source distilled to not less than 94 per cent alcohol by volume. Prior to final filtration may be treated with a strongly acid cation exchange resin in the sodium ion form, or a weakly basic anion exchange resin in the hydroxyl ion form. During aeration, a younger wine's exposure to air often "relaxes" the drink, making it smoother and better integrated in aroma, texture, and flavor. Older wines generally fade (lose their character and flavor intensity) with extended aeration. Despite these general rules, breathing does not necessarily benefit all wines. Wine may be tasted as soon as the bottle is opened to determine how long it should be aerated, if at all. When tasting wine, individual flavors may also be detected, due to the complex mix of organic molecules (e.g. esters and terpenes) that grape juice and wine can contain. Experienced tasters can distinguish between flavors characteristic of a specific grape and flavors that result from other factors in wine-making. Typical intentional flavor elements in wine—chocolate, vanilla, or coffee—are those imparted by aging in oak casks rather than the grape itself. The ideal temperature for serving a particular wine is a matter of debate by wine enthusiasts and sommeliers, but some broad guidelines have emerged that will generally enhance the experience of tasting certain common wines. A white wine should foster a sense of coolness, achieved by serving at "cellar temperature" (13 °C [55 °F]). Light red wines drunk young should also be brought to the table at this temperature, where they will quickly rise a few degrees. Red wines are generally perceived best when served chambré ("at room temperature"). However, this does not mean the temperature of the dining room—often around (21 °C [70 °F])—but rather the coolest room in the house and, therefore, always slightly cooler than the dining room itself. Pinot noir should be brought to the table for serving at (16 °C [61 °F]) and will reach its full bouquet at (18 °C [64 °F]). Cabernet Sauvignon, zinfandel, and Rhone varieties should be served at (18 °C [64 °F]) and allowed to warm on the table to 21 °C (70 °F) for best aroma. Wine is a popular and important beverage that accompanies and enhances a wide range of cuisines, from the simple and traditional stews to the most sophisticated and complex haute cuisines. Wine is often served with dinner. Sweet dessert wines may be served with the dessert course. In fine restaurants in Western countries, wine typically accompanies dinner. At a restaurant, patrons are helped to make good food-wine pairings by the restaurant's sommelier or wine waiter. Individuals dining at home may use wine guides to help make food–wine pairings. Wine is also drunk without the accompaniment of a meal in wine bars or with a selection of cheeses (at a wine and cheese party). Wine is important in cuisine not just for its value as a beverage, but as a flavor agent, primarily in stocks and braising, since its acidity lends balance to rich savory or sweet dishes. Wine sauce is an example of a culinary sauce that uses wine as a primary ingredient. Natural wines may exhibit a broad range of alcohol content, from below 9% to above 16% ABV, with most wines being in the 12.5–14.5% range. Fortified wines (usually with brandy) may contain 20% alcohol or more. Alcoholic beverages, including wine, are forbidden under most interpretations of Islamic law. In many Muslim countries, possession or consumption of alcoholic beverages carry legal penalties. Iran had previously had a thriving wine industry that disappeared after the Islamic Revolution in 1979. In Greater Persia, mey (Persian wine) was a central theme of poetry for more than a thousand years, long before the advent of Islam. Some Alevi sects–one of the two main branches of Islam in Turkey (the other being Sunni Islam)–use wine in their religious services. Wine contains ethyl alcohol, the same chemical that is present in beer and distilled spirits and as such, wine consumption has short-term psychological and physiological effects on the user. Different concentrations of alcohol in the human body have different effects on a person. The effects of alcohol depend on the amount an individual has drunk, the percentage of alcohol in the wine and the timespan that the consumption took place, the amount of food eaten and whether an individual has taken other prescription, over-the-counter or street drugs, among other factors. Drinking enough to cause a blood alcohol concentration (BAC) of 0.03%-0.12% typically causes an overall improvement in mood and possible euphoria, increased self-confidence and sociability, decreased anxiety, a flushed, red appearance in the face and impaired judgment and fine muscle coordination. A BAC of 0.09% to 0.25% causes lethargy, sedation, balance problems and blurred vision. A BAC from 0.18% to 0.30% causes profound confusion, impaired speech (e.g. slurred speech), staggering, dizziness and vomiting. A BAC from 0.25% to 0.40% causes stupor, unconsciousness, anterograde amnesia, vomiting, and death may occur due to inhalation of vomit (pulmonary aspiration) while unconscious and respiratory depression (potentially life-threatening). A BAC from 0.35% to 0.80% causes a coma (unconsciousness), life-threatening respiratory depression and possibly fatal alcohol poisoning. As with all alcoholic beverages, drinking while driving, operating an aircraft or heavy machinery increases the risk of an accident; many countries have penalties against drunk driving. The main active ingredient of wine is alcohol, and therefore, the health effects of alcohol apply to wine. Drinking small quantities of alcohol (less than one drink in women and two in men) is associated with a decreased risk of heart disease, stroke, diabetes mellitus, and early death. Drinking more than this amount however, increases the risk of heart disease, high blood pressure, atrial fibrillation, and stroke. Risk is greater in younger people due to binge drinking which may result in violence or accidents. About 3.3 million deaths (5.9% of all deaths) are believed to be due to alcohol each year. Although lower quality evidence suggest a cardioprotective effect, no controlled studies have been completed on the effect of alcohol on the risk of developing heart disease or stroke. Excessive consumption of alcohol can cause liver cirrhosis and alcoholism. The American Heart Association "cautions people NOT to start drinking ... if they do not already drink alcohol. Consult your doctor on the benefits and risks of consuming alcohol in moderation." Population studies exhibit a J-curve correlation between wine consumption and rates of heart disease: heavy drinkers have an elevated rate, while people who drink small amount (up to 20 g of alcohol per day, approximately 200 ml (7 imp fl oz; 7 US fl oz) of 12.7% ABV wine) have a lower rate than non-drinkers. Studies have also found that moderate consumption of other alcoholic beverages is correlated with decreased mortality from cardiovascular causes, although the association is stronger for wine. 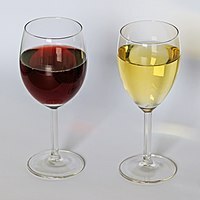 Additionally, some studies have found a greater correlation of health benefits with red than white wine, though other studies have found no difference. Red wine contains more polyphenols than white wine, and these could be protective against cardiovascular disease.